My husband has decided he's on a health kick. In the last couple of months he has started walking every night and cutting down on the amount of fat and calories in his diet. I have been trying to get this to happen for years, but apparently lately he has had some sort of change of heart in regards to his bad habits. This is a welcome change and he has embraced eating less red meat and more vegetarian meals. Tofu has been the hardest food to add to my family's diet. They will willing eat beans, lentils and soups without meat, but tofu has been more of a problem. Luckily I have discovered that my kids in particular love stir-fry using tofu and the May/June issue of Eating Well magazine had a recipe for Three-Pea, Cashew and Tofu Stir-Fry which looked perfect. This recipe has 12 ingredients. It takes 50 minutes of total time, all of which is active and makes 4 servings. I had to go to two stores in order to find both snow peas and sugar snap peas, but that is normal for my area. My tofu took slightly longer than the 8 minutes suggested by the recipe in order to fully brown. I also made sure to let my tofu drain for a full hour to ensure that all the water came out. Finally, I let the peas cook longer than the recipe to ensure that they were soft enough for my two boys to eat. I followed the remainder of the recipe as written. I was surprised by how much my two boys loved this dish. They were particularly fans of the sugar snap and snow peas and ate their servings, plus part of mine. My husband and I enjoyed this stir-fry as well. The only draw back that I found was that the tofu wasn't salty enough and needed a little more flavor. I would suggest adding some of the sauce to the tofu after it is browned and letting the tofu sit and marinate while the vegetables are cooking. This would greatly improve the flavor of the tofu. Overall, a great way to add more vegetables and tofu into your diet. 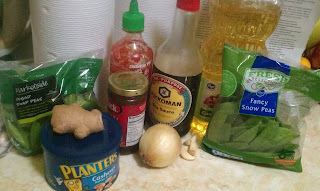 For the recipe go to Three-Pea, Cashew and Tofu Stir-Fry. It has taken me a while to convince my husband also :) Tell me how the recipe goes! That looks amazing. I have never cooked with tofu. I am going to try it. Thank you for sharing. Ben's on a vegetarian kick. This will be perfect! That's not cheating :) The flavors would be great with cut-up chicken thighs! Glad your husband's on a health-kick and I hope it lasts! My husband is not a fan or cashews or peanuts. Do you think that almonds would work in this recipe? Also, I like your picture much better than Eating Well's picture of the finished dish!